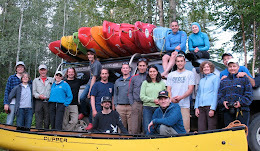 Recently we held our Annual General Meeting and voted in the Brigade executive for next paddling season. With lots of new paddlers on the scene this year, it should come as no surprise that almost every position was taken by someone who has just started in the sport. Great to see the enthusiasm! 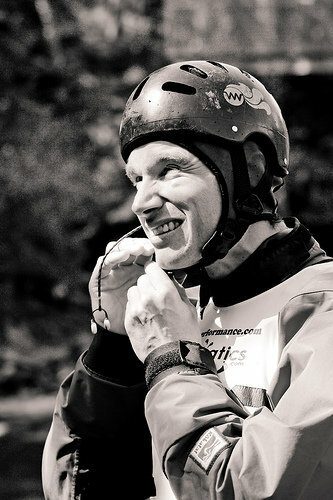 There is no doubt that they will bring new energy to the club and our paddling community in 2012. From left to right in the above picture, we have our President Dani, Scribe Hayley, Assistant Jesse, and Vice President Curtis. Club assistants not pictured include Erin, Rob, Matt D, Ian and others. Rounding out the executive is Rick who once again will take the reigns as Treasurer. Thanks to all of you for stepping up to the plate. Pictured below is the VP and Prez ripping up Isle Pierre on the Nechako River during a sunny September trip. 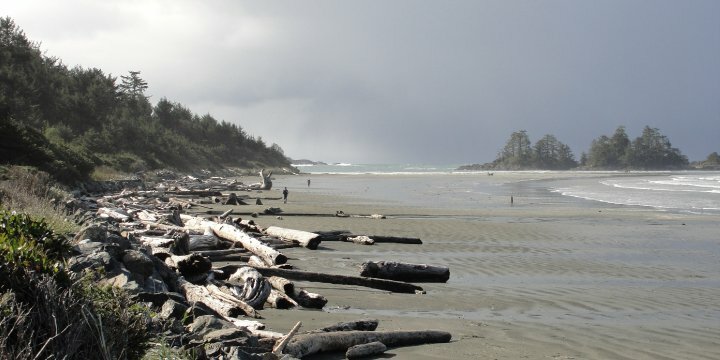 Located on the west coast of Vancouver Island next to Pacific Rim National Park, the town of Tofino is well known as a resort community that's popular with tourists, beach lovers, and storm watchers. It's also considered to be the surfing capital of Canada and is a great destination for a winter kayak road trip. 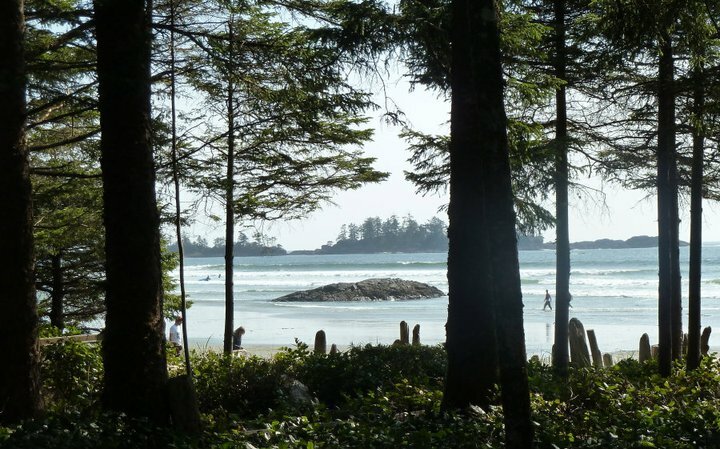 The surf is spread out along a series of west-facing beaches south of Tofino including Mackenzie, Chestermans, and Cox Bay. 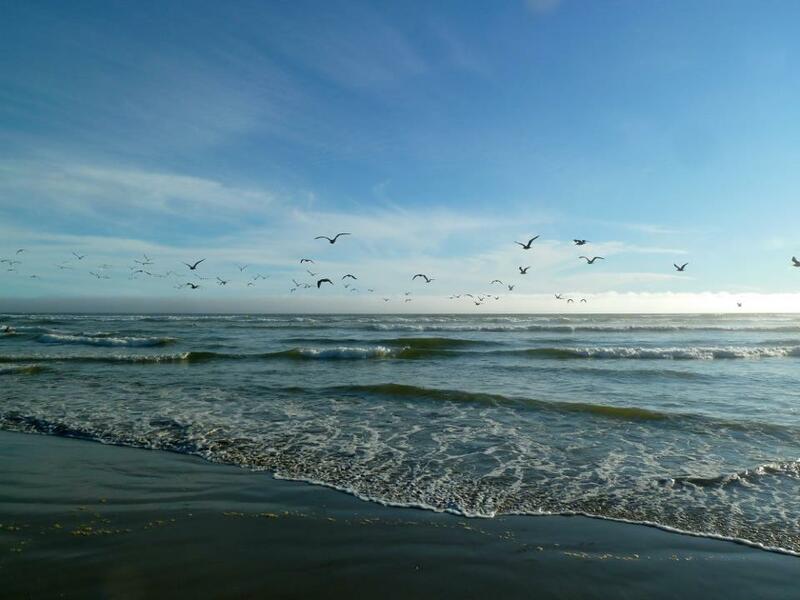 Further south in the adjacent National Park is Long Beach, Wickaninnish Beach, and Florencia Bay closer to the town of Ucuelet. The surrounding scenery is spectacular with open ocean, rainforest and coastal mountains. Shown above is a beautiful peeling right taken in Cox Bay. If you get waves like this consider yourself lucky because surf conditions on the west coast are quite variable. Generally the most consistent surf is found during the fall to spring season, but this is also a time when huge storms can occasionally blow through bringing wind, rain, and huge waves. During the summer months, there's certainly a better chance of sunshine and cleaner conditions, but you can also get skunked and have no waves at all. Understanding the forecast conditions is important to planning a surf trip and knowing what to expect once you're there. The first time I went to Tofino I was a novice. We stayed at a place right in Cox Bay and that's the only spot we surfed. While it was convenient to stay and surf in the same place, the conditions at Cox were too big for most of us. 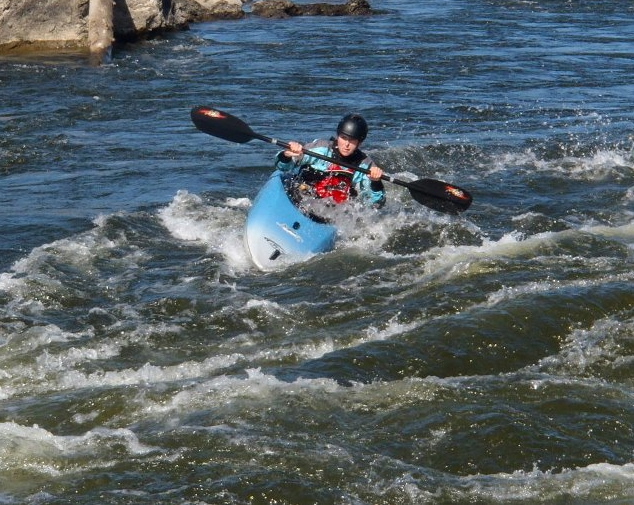 The more experienced kayakers couldn't get outside to the green waves, and the novices in the group got worked. There were several swims. 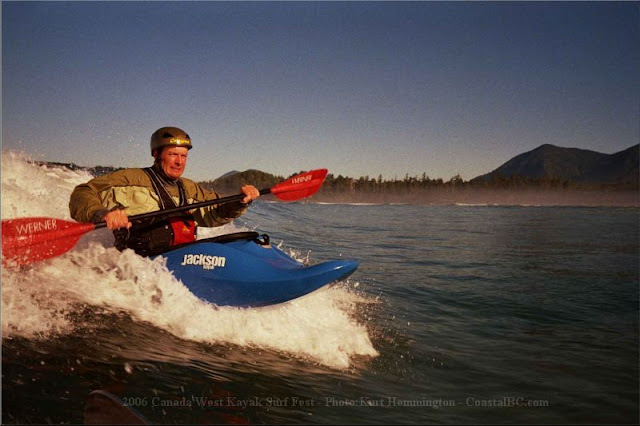 No biggy, but not really an ideal introduction to surf kayaking. Had we known there were other beaches nearby with more moderate conditions, I don't think we would have surfed there. To find out the forecast or what current conditions are like, check websites like Magicseaweed, the Washington Marine Forecast, or buoy data at La Perouse Bank. The most important variable to pay attention to is the size of the swell, because it has the largest influence on how big or small the waves will be. Keep in mind that the swell size does not translate directly to wave height. Many other variables influence wave height such as swell direction, wave period, wind speed, wind direction, and tides. Generally, when the swell is really big (~15 foot +), it's better to head to spots like Mackenzie Beach where it's sheltered from the brunt of the swell. When the swell is much smaller than this Mackenzie will be totally flat, but Cox Bay, Long Beach, Wickaninnish, and Florencia Bay will still have good waves as they are more exposed. Between fall and spring, it's usually somewhere in between and then Chestermans is where it's at. 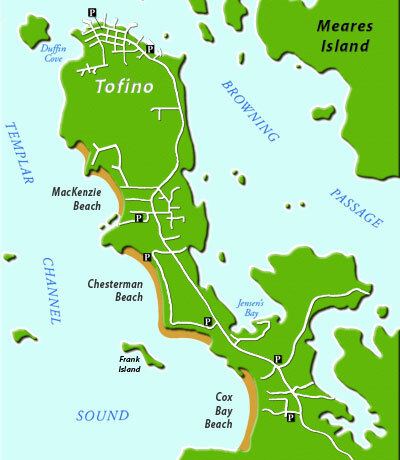 Conveniently, it's quite easy to drive around and check out the three main beaches closest to Tofino (below), as they will have enough variety for any level of paddler. While driving south into the National Park isn't necessary, it can be fun if you're into exploring or it's busy and you'd rather avoid the crowds. 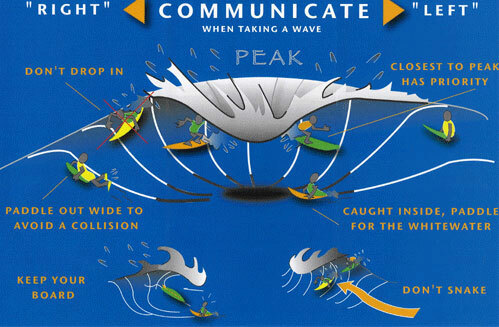 For the uninitiated, it's a good idea to learn basic surf etiquette before paddling out (above). 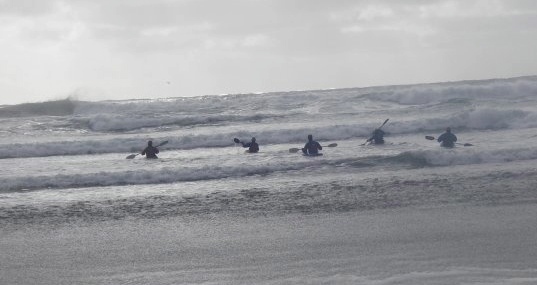 This includes not dropping in when someone else is on the wave, giving priority to the person closest to the breaking peak of the wave, and not paddling around someone who's waiting for a wave (snaking). 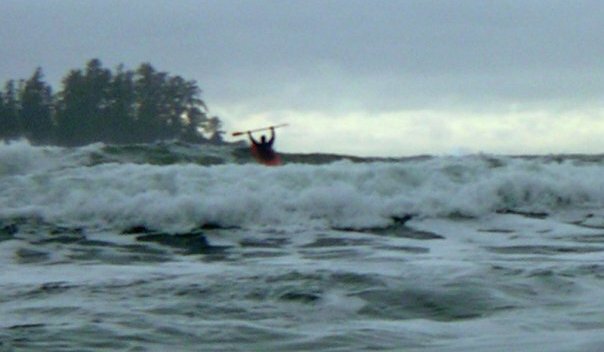 After that first humbling trip to Tofino in 2006, I returned several more times. During fall or winter when we were jonesing for a whitewater fix, a few of us would head down there for a few days. It was a fantastic place to learn the basics of playboating and get comfortable in bigger whitewater features. 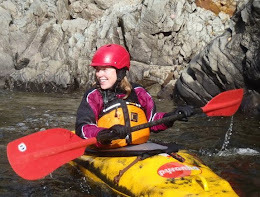 One kayak trip that sticks out in my memory was during the Remembrance Day weekend in 2007. 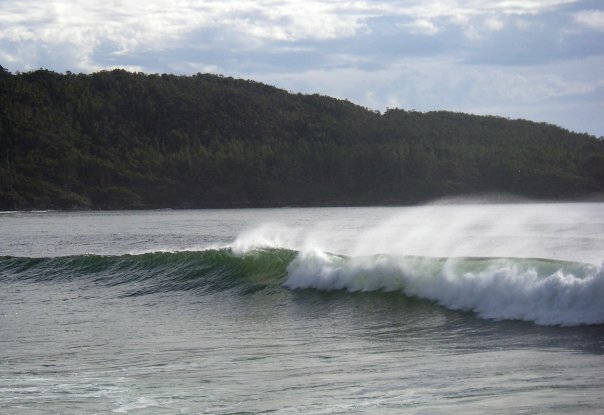 When we arrived we had awesome conditions including sunshine and fun waves. 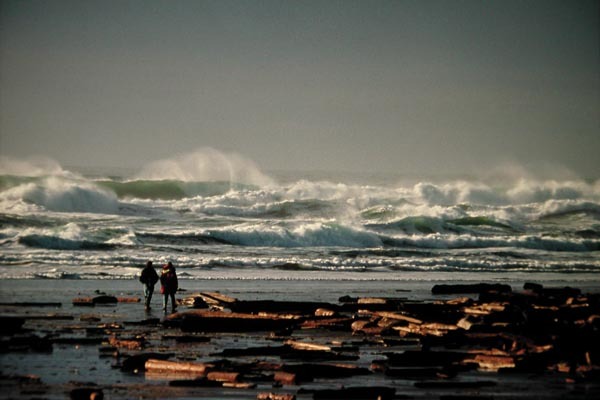 However, during the second night a massive storm slammed into the west coast with 100+ km/h winds and 25 feet swell. When we got to the beach the following morning the seas were a maelstrom of whitewater. When the wind gusted it almost knocked you over. Going out in the water was not an option at most spots. But we had driven a long time to get there, so we headed to Mackenzie Beach where it wasn't as crazy. Below is a shot of me on a wave well inside of where the big sets were breaking. Look closely and you can see the looming grey walls of water in the background. Extreme storm conditions like the Remembrance Day trip can happen on the west coast, especially during late fall or winter. Generally though, they are uncommon and don't last long. Most people stay out of the water when they do happen, not just because it's unsafe but the wave quality is usually very poor during a storm. Can you imgaine surfing the waves below? Most of time, kayak surfing in Tofino is suited to any level of boater. This is because of the variety of beaches that provide options for the size of surf you want. Beginners can learn to play "inside" where the smaller waves are, and because the beaches all have sandy bottoms it's reasonably safe of underwater hazards (i.e, no reef or rocks). It is also easy to wade out of the water if you need to self-rescue. For intermediate and advanced boaters, the biggest waves and the best potential for fast rides and dynamic moves are "outside", where the green waves first start breaking. All the modern playboating moves are possible on a decent-sized ocean wave. 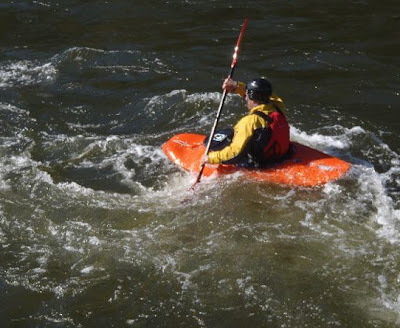 As far as the cold water goes, it's no different than paddling around PG in the early season. As long as you're properly outfitted, it's easily tolerable. Apart from ocean kayak surfing, there's some great whitewater rivers to check out on the island as well. 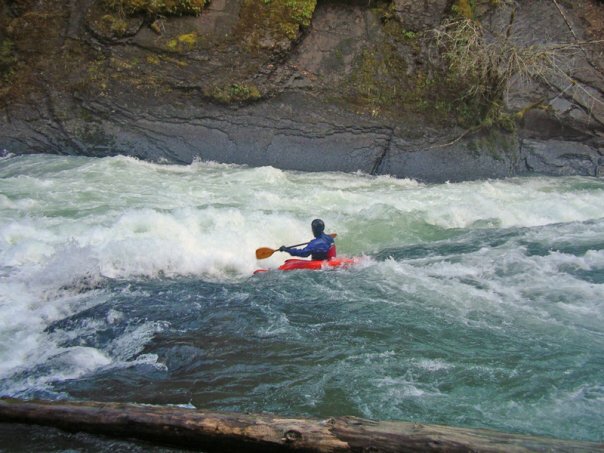 The whitewater season on Vancouver Island is during the interior's offseason. The Cowichan (class II-III), Naimo (class II-III), Gordon (III-V), and Koksilah Rivers (III-IV) are super fun and not far off the beaten path to Tofino. Be sure to look up Don and Rose at the Warm Rapids Inn for hook-ups as they live and work right on the Cowichan River. Don't forget there's also the Capilano River (class II-III) and Lynn Creek (III-IV) in North Vancouver if the level is good. 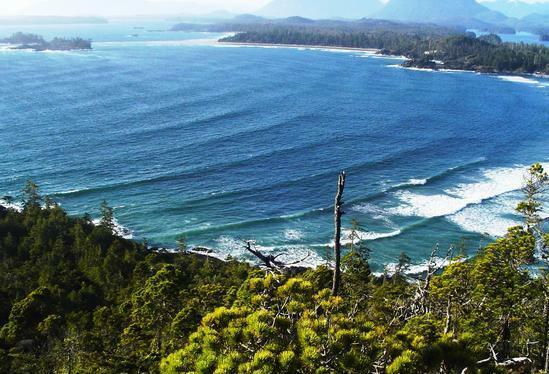 Before signing off, I should add that there are other decent places to surf on the west coast of British Columbia aside from Tofino. On the southern end of Vancouver Island these include Jordan River, Sombrio, and Port Renfrew. On the north end of the Island there's Raft Cove and San Josef Bay. Up on the north coast of BC there's Haida Gwaii (picture below), a stand-out if only because of its proximity to Prince George. 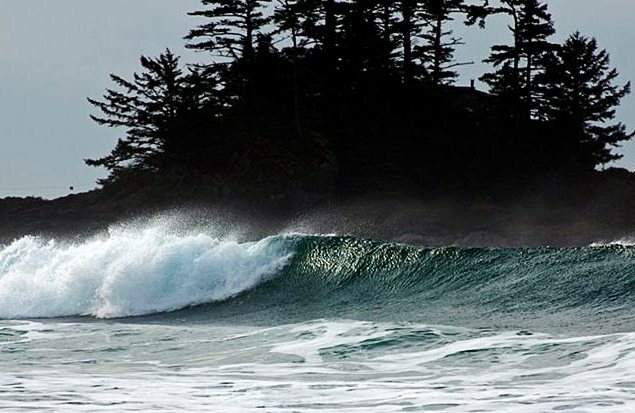 It may not have the amenities of Tofino, but Haida Gwaii definitely has the waves and wild west coast scenery. As a surf destination it barely receives any attention at all, but I think the locals like it that way. Enjoy! Both Matt Delong and I have a reputation for extreme slowness in the club. No surprise, then, that this write-up is so late. It would definitely be pushing it to call this a club trip... in fact it was probably the smallest club trip since the president of the Baltimore State prisoner rehabilitation society suggested Christmas Dinner with Hannibal Lecter. 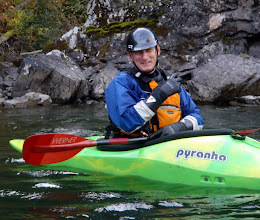 Nevertheless back in June Matt and I loaded up our sea kayaks and headed south to the Bowron Lakes for what we thought would be four days of gentle paddling and soaking up the Cariboo Mountain scenery. There would certainly be plenty of paddling, and as it turned out, soaking. After a night camping in the park near the put-in we attended an early morning orientation session in which the park warden showed us the various ways we were likely to get killed by bears. She also mentioned that it would be unlikely we could outrun the mosquitoes. Unperturbed we loaded our gear into our kayaks and figured we'd make a quick start whilst the other paddlers - all in canoes - had to have their gear weighed. The first part of the circuit is a long 2.4km portage that had us both puffing and sweating before we'd turned the first corner. We'd loaded some gear in backpacks and some in the boats, but it was a long, tough haul in the heat. The mosquitoes prodding every time we stopped encouraged us to go faster. Kibbee lake was the first actual paddling and the small lake slid by in about 20 minutes. We had a quick lunch on the far side and then tackled the second longest portage, 2km, to Indianpoint Lake. Indianpoint started to give me a sense of what being in the wilderness is really like, there were no people and other than the slow splash of two kayak paddles there was no noise. We held the left shore and crossed the lake fairly quickly, spotting our first moose on the far bank. We'd aimed to get the first three portages out of the way on day one, so when we arrived at the end of Indianpoint Lake with plenty of afternoon left we knew we were in good shape. We decided to try a different approach and moved all our gear across the portage, then came back for the kayaks. I wasn't sure it was any easier than hauling the lot in one go, but it was a nice day for a walk. Plus it gave the mosquitoes two chances for an evening meal. The bugs were bad there, mainly due to the high level of Isaac Lake. The far side of the portage was all boggy. I suggested to Matt we paddled down some of Isaac Lake, and we soon found a campsite for the night. After a pizza dinner we both turned in. Something creeping in the campsite during the night gave me a scare and I sat for a while wondering if nylon tent was to a bear just like wrapping lunch in a bag. It started raining in the night and didn't stop for two days. We got up and started down Isaac Lake extremely late, paddling all afternoon in the rain. 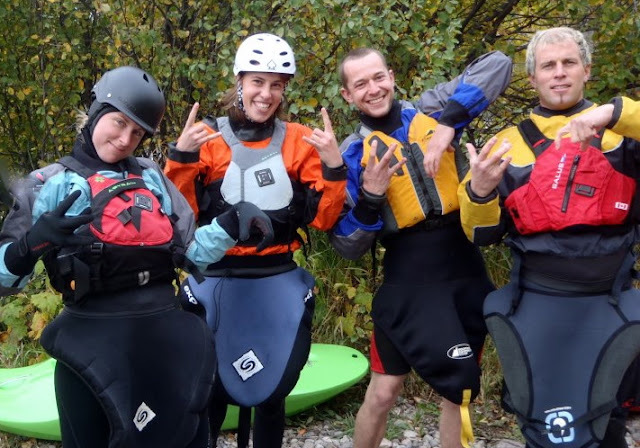 I was wearing drytop and pants but may as well have dressed in a teabag, by mid-afternoon I was soaked through and shivering whenever we stopped paddling. Matt was little better and when we came across a guy fishing he tried to talk and was not able to get a sentence out properly. The fisherman offered us a hot drink and we found that we were at one of the few cabins around the lake circuit. The four guys in the cabin made us hot tea and after a short discussion we decided to stay the night outside on a tent pad. Sadly the tent pad was on a small spit of land between two gushing rivers and the rivers were starting to flood the site with all the rain. Added to that the four guys had spread the remains of their fish all over the place. We cleaned up but were convinced that flooding, bears or hypothermia were going to get us. The following day we pressed on down Isaac Lake in the rain, I'd figured we would manage the whole lake in one day but as morning turned to afternoon and rain to hail, we pulled up at the end of the lake shivering and ran for the group shelter there. Someone got a wood stove going and neither of us wanted to move. So the third day of the trip ended and we were still, technically, on Isaac Lake. So much for doing the whole circuit in four days, and I was rather glad we packed five day's worth of food! We were both determined to make progress on day four and we left camp fairly early - for us - in the morning. We ran 'The Chute' which is a rapid leading from Isaac Lake into the Isaac river and then enjoyed the rapids as we followed the river for a bit. There were a few portages and after McLeary lake we were on the Cariboo River. It made a lovely change to let the current take us and the sun came out along with the view. We were surrounded by mountains instead of clouds. We passed a wrecked canoe and shouted to make sure no one was stranded nearby. The canoe looked like it had been there awhile though. The river emptied into Lanesi lake and almost immediately a storm hit us, the headwind crashing waves over us and making it very difficult to paddle. I saw Matt with his head down powering into the wind and just tried to follow, battling the wind for control of my paddle blades. When we pulled in to check on some canoeists the wind died and we got to paddle almost a third of the lake in sunshine before the wind hit us again. We turned the South West 'Corner' of the circuit and paddled into Sandy lake and out of the wind. It was late but we both felt strong and just agreed to keep going. We figured there were three short portages to do and then it would be all paddling. If we could get the portaging done that evening then we'd easily finish the circuit the next day. As my supplies amounted to a bowl of oatmeal and some beef jerky I thought that was a good plan. The rain came back and made paddling unpleasant for a couple of hours, until at the end of Babcock lake we started portaging and the rain stopped. The sun, just about to dip over the horizon, came out from behind a cloud. We were approaching Skoi lake and talking when a big moose stepped up out of the lake right in front of me. She had a calf and they both swam off much to my relief. As we began paddling across Skoi lake the water steamed in the sunset. A Loon sat calling. Another moose on the far bank ran into the forest as we paddled closer. When we reached the shore and stopped for the night finally, we'd been paddling for eleven hours straight. I ate my last dinner by the light of my headlamp. It was hard to start paddling the next day... the thought of a burger and a hot shower was about all that got me moving. We paddled up Spectacle and Swan lakes and then wound through the Bowron river into Bowron Lake. My body was on automatic and had long since gone pretty numb as we paddled back into civilisation. There were houses and motorboats on Bowron lake. We congratulated each other at the top and whilst we loaded the truck the park ranger turned up and asked if we were the two people that had made an emergency VHF call from in the park. Apparently two guys had stopped in the stormy weather and simply ran out of food. Matt had to stay awake and drive us home which was not easy. We both looked like refugees from Woodstock. All we could do for several days was sleep, eat and scratch our bug bites.